How would you like to own a pizza-sized gold coin? If you are the highest bidder in the upcoming online auction put on by Escala Group, a global collectibles company in stamps, coins and militaria, you will. 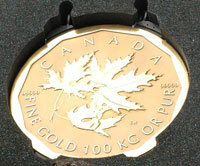 The coin, which will be on auction beginning August 16, is a 100 kilogram coin published by the Royal Canadian Mint. It weighs over 220 pounds contains more than $2 million of gold bullion. The auction coincides with the launch of Teletrade Direct, a new service to sell gold, silver and platinum bullion coins. “Itâ€™s the most valuable coin ever offered in an online-only auction,” said Ian Russell, President of Teletrade, an online rare coin auction company. Teletrade is part of Escalaâ€™s Spectrum Numismatics division. I would love to get my hands on a giant 5 oz krugerrand. Who would buy this? Gold speculator or private collector? Who owns the coin currently? I’d like to get my hands on that baby!